In the process of creating a professional Twitch channel, my overall goal is to deliver the best experience possible for viewers. On Xbox One, Microsoft has yet to include the option to down-mix chat into the HDMI audio. All of the voice activity is done separately through the controller. This prevents any chat from being integrated into a live stream or recording through a capture card. There is an option to use the Kinect as a microphone to capture the broadcaster’s voice and put it into the audio but for the people without one, or when it’s too far away in my case, this isn’t a proper solution. Through countless hours of research, I thought up a plan to use analog audio splitters routing from the controller to my headset, back to the controller and then to my PC. It might not come as a surprise that it didn’t end up working out. After all, no one else on the internet had tried it so I figured I was either going to be the first to do it or there was another solution I haven’t come across yet. Once the cables arrived and I found out it wasn’t the right solution, I discovered the Astro Mixamp. The Mixamp is bundled with the Astro A40 headset, or available on its own at a discounted price. I have the Turtle Beach PX51 headset, so this is the reason why I didn’t know it existed until now. I chose to buy the one bundled separately since I already have a high end set of headphones. It wasn’t a guaranteed solution but I was eager to try it out as I was quickly running out of options. With the launch of the Twitch channel coinciding alongside Sunset Overdrive’s release, I was running out of time. 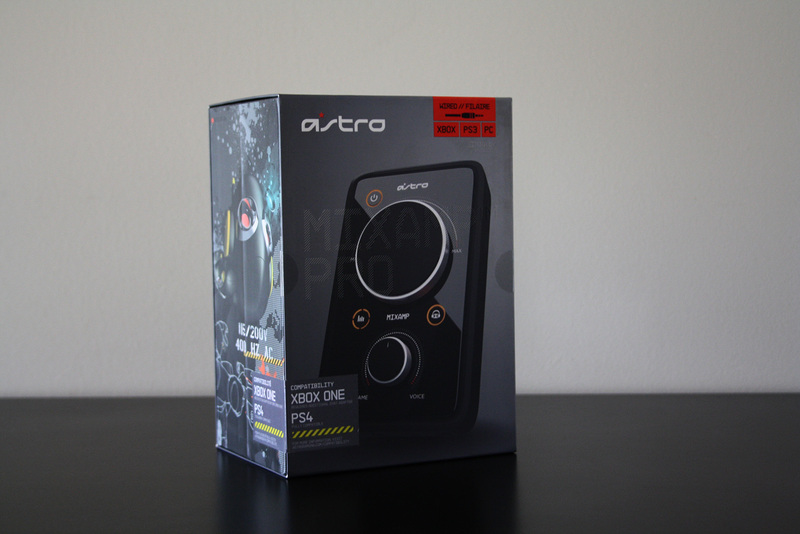 The first thing I noticed about the Astro Mixamp is that it feels like a well built product. It has some weight to it and the dials provide resistance when turned. The main control is for overall volume and the smaller one below is to balance game audio and chat. The Xbox One headset adapter offers the same functionality, but this Mixamp is compatible with all platforms so they needed to provide it separately. There is a button on the top left for power, equalizer settings on the middle left, and Dolby Surround on the right. There are 4 ports at the top of the device. From right to left you’ll find USB to power the Mixamp, which can be plugged into a console’s USB port or on a computer. Next is a Stream option that connects a 3.5mm audio cable to a PC’s microphone port. This allows all audio to be routed to the computer to be used in recordings or live streams. Users are able to play a mobile device through the MP3 port using a standard 3.5mm audio cable. The last connection is Optical. This requires the use of the included cable as it has a different end. It will attach to the Optical port on the console or PC. This enables the game audio to be sent to the Mixamp. The bottom has two inputs on the outside left and right side to daisy chain Mixamp’s together. This creates a local chat network mostly used for tournaments. The inside ports are for the headset and the controller to send and receive chat audio. For my set up, the Turtle Beach PX51’s connect separately to the console through Optical. The game audio is sent separately from the Mixamp since they are wireless. I only use the Mixamp for voice and chat. By having the Kinect microphone off and my headset taking care of the game audio, I’m able to route only the chat audio to my PC via the Stream input. Now that this audio is being sent through my desktop, it is also integrated into the stream. This provides a more enjoyable experience for viewers as the entire party is able to be heard through the broadcast and not only my voice. It has been a worthwhile learning experience to get all of this set up, and I look forward to building a successful Twitch channel with this entire set up. With Sunset Overdrive and the Evolve Big Alpha currently on board and Call of Duty launching next week, my journey to the top has only just begun.